Spoiler: Jesse Williams literally gets androids woke. I don't know when I'll get to play Detroit: Become Human again. 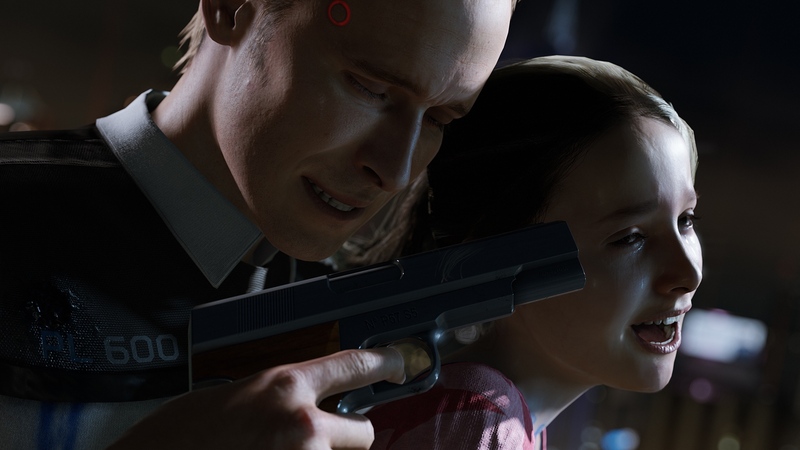 The latest game from David Cage's Quantic Dream studio (Heavy Rain, Beyond: Two Souls) conspicuously didn't have a release date, or, hell, even a release year when Sony showed off a brand new demo at its media briefing earlier this week. Behind closed doors I was shown an extended version of the stage demo and saw just how an android riot starts. At every turn there were at least a few choices to make, and some were beyond the binary "peaceful" or "violent" options. Peaceful protest meant doing things like tagging park benches or planting a flag at the top of a building. Inciting a riot was a bit more... hands-on. Tossing bricks through windows, driving a garbage truck through an android showroom's plate-glass window, flipping cars and starting fires were the order of the snowy night. And once the Motown square was razed, the presentation was over and I was able to go outside and play last year's previously hands-off demo, which centered on an android hostage negotiator. I was pressed for time, so I wasn't able to fully explore the penthouse apartment for evidence to see how and why the android nanny was holding his charge hostage on the rooftop. Going out to the rooftop with less than 50 percent of the evidence (there's a confidence meter of sorts) I wasn't sure what would happen. I screwed up my first attempts at winning the caretaker over and sensed things were about to go south. Surprisingly, I was able to salvage the situation, but at a great cost. At the last minute I reached out and grabbed the little girl, just as the nanny started falling backward off the roof, pushing myself in the adolescent's place and getting her to the roof. Then I reflexively covered my mouth as my character, the negotiator, started falling backward in slow motion toward the Motor City street below. For people who played Mass Effect 3, this should be a familiar scene. Because this is a David Cage game, that would mean in the full version that this character's story would end. Yes, I saved the girl and got a "mission accomplished," but at the cost of seeing where the negotiator's narrative thread would end. For a demo, it's not a huge deal. But in the full game, whenever it comes out, that means missing out on a huge swath of story. Despite the game not having a release date and being an alpha build, everything looked incredible on a visual level. There were a few hitches in animations here and there, but on the Sony 4K TV (which looked like an OLED; I wasn't able to confirm) connected to PS4 Pro hardware, faces were incredibly expressive and detailed, skirting the uncanny valley for a slightly stylized appearance. That's to say nothing of how detailed and believably cluttered the environments were in each demo. It takes me only around three hours to drive to the real Detroit, but I still can't wait until whenever Quantic Dream is done with its virtual version so I can see how an android uprising plays out.